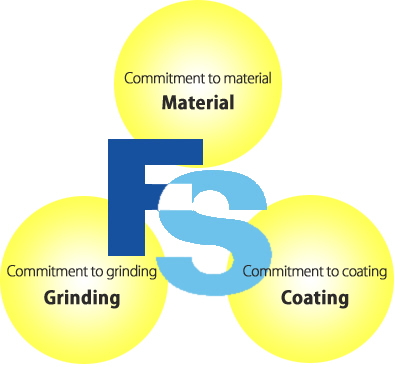 Our three commitments - Product Information - FUJI SHOKO CO.,LTD. We use high quality Swedish steel to manufacture doctor blades by conducting integrated production from own blade grinding process to surface coating process. Currentry use steel with the highest straightness and flatness. Manufacture steel thorough the special metal processing procedures in order to drastically reduce the amount of impurities in metal. The formation of nano-structures is contributed to achieve uniform blades wear. Boast high precision blade edges and shapes achieved by employing our own surface grinding method. Employ the precision processing technology to treat blades edges in order to process the initial printing smoothly. Treat an edge that is said to be a life of doctor blade with the greatest possible care and conduct a strict inspection to assure quality. Enable coast reduction by employing double edge blades. Offer a process to make an angle of a blade edge. Promote a reduction in the frequency of exchanging blades and an increase in operation rates by improving wear resistance. Reduce problems relating to doctor blades by applying newly developed surface treatment technology. Reduce printing defects by decreasing burrs caused by wearing of blade edges. Anti-rust caoting and compatible with water-based printing ink.